Barkzilla: A Savvy NYC Dog Blog: #ThursdayBling + Barkzilla = Sparkly Fun! Everyone needs a little bling in their life, which is why we started #ThursdayBling with one of our awesome Twitter pals (@MissMarisol). The premise? Each week to get through the doldrums of Thursday, we'd wear something sparkly and fantastic and tweet each other pictures. While #ThursdayBling has not taken over the internet as a trending topic (YET), we've decided to bring it to Barkzilla! 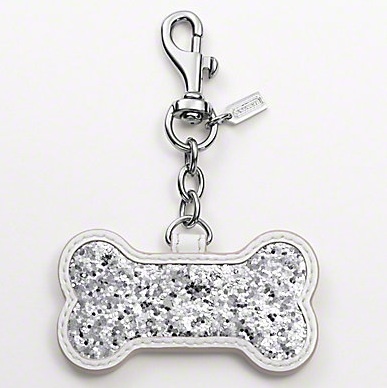 This week's Thursday Bling is from one of our favorite accessory houses, Coach, and perfectly melds the themes of Thursday Bling and Barkzilla (i.e. pretty shiny things + dogs). 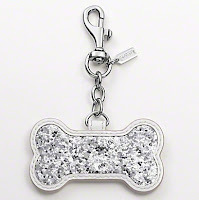 This gorgeous glittery key charm from Coach's Poppy Line is just screaming to be clipped to your leash to add a little sparkle on your daily walk. Trimmed in leather, it comes with the necessary attachments to hook it on a leash. Pick yours up from your local Coach store or online at www.coach.com for $30. p.s. How cute would this be for a stocking stuffer?